Few studies in pediatric neurorehabilitation have focused on outcomes beyond the level of body structure and function with the International Classification of Functioning. This study describes the distribution of parent goals as identified by the Canadian Occupational Performance Measure (COPM) using the framework of the International Classification of Functioning—Children and Youth for children receiving constraint-induced movement therapy (CIMT) intervention and reports changes in COPM scores before and after CIMT intervention. In this retrospective chart review, occupational performance outcomes were assessed with COPM at baseline and immediately postintervention. The study included 41 children with hemiplegia (25 boys, 16 girls; mean age, 3.7 years [SD = 1.8; range, 1.4–12.4 years]; Gross Motor Function Classification System level I = 24, II = 17; Manual Ability Classification System level I = 10, II = 22, III = 9). Significant gains were seen in COPM performance (p < .001) and satisfaction scores (p < .001) after CIMT intervention. Parents of children in the youngest age group (0–3 years) reported the most significant positive change in both COPM performance and satisfaction. Scores for COPM performance after intervention were significantly associated with satisfaction (rs = .844; p < .001). The World Health Organization defines “impairment” as a problem with the structure or function of the body, “activity” as the performance of an action or task by a person, and “participation” as engagement in a life situation (World Health Organization, 2007). To date, few studies of pediatric neurological disorders have focused on outcomes beyond the level of body structure and function using the International Classification of Functioning (Gordon, 2014). Constand, MacDermid, Dal Bello-Haas, and Law (2014) reported that although the definition of patient-centered care has no clearly defined framework, the literature supports the themes of communication, health promotion, and partnership. In rehabilitation, it is often patients and their families who define success despite the outcome of clinic-based standardized assessments. The key elements of family centered practice include collaborative goal setting recognized as key components of the partnership aspect of client centered care. Psychology research . . . has shown . . . clear and functional goals enhance motivation and improve outcomes. Current research suggests that targeted interventions that use goals tailored to the individual parent and/or child may motivate children's participation and skill mastery and optimize the outcomes of therapy (Miller, Ziviani, Ware, & Boyd, 2014; Palisano, 2014). Pediatric constraint-induced movement therapy (CIMT) is an effective intervention for children who have both acquired and congenital hemiparesis (Brady & Garcia, 2009; Huang, Fetters, Hale, & McBride, 2009; Novak et al., 2013; Reidy et al., 2012). Studies have used a wide array of tools to quantify changes after this intervention. In addition, reports by Mancini et al. (2013) and Gilmore, Ziviani, Sakzewski, Shields, and Boyd (2010) analyzed qualitative information from interviews with children and caregivers on their perceived experience and gains after CIMT. Several studies have used the Canadian Occupational Performance Measure (COPM) (Law et al., 2005) to document outcomes of this intervention (Boyd et al., 2010; Reidy et al., 2012; Sakzewski, Provan, Ziviani, & Boyd, 2015); however, none reported on the therapeutic goals and priorities identified by the parents of children with hemiplegia. Although not specific to children with hemiplegia who participated in CIMT, Pollock et al. (2014) described parent-identified goals in young children with cerebral palsy. They reported on parent-identified goals in a group of 128 children who had varied types of cerebral palsy and were randomized to receive either context-focused or child-focused therapy. They examined the effect of child factors, intervention factors, and goal factors on the change in COPM scores (Pollock et al., 2014). They used the International Classification of Functioning, Disability and Health—Children and Youth Version (ICF-CY) to further code parent responses on the COPM with the linking rules described by Cieza et al. (2005). With the protocol described by Cieza et al. (2005) used as a model, this study had two objectives: (a) to describe parent goal distribution as identified by the COPM with the framework of the ICF-CY (World Health Organization, 2007) for children receiving CIMT intervention and (b) to report changes in COPM scores before and after CIMT intervention in a pediatric clinic. Institutional review board approval was obtained for this retrospective chart review that collected demographic information, functional status, and COPM data from patients 13 years and younger who were enrolled in an established CIMT program (Reidy et al., 2012) from 2008 to 2014. Study inclusion criteria included children who met the clinical criteria for participation in the program (Reidy et al., 2012) and who had either acquired or congenital hemiplegia. Clinical criteria were minimal and required the participants to tolerate therapy, be at least 1 year old, have a clearly dominant arm, walk independently, and be seizure-free for at least 6 months before starting the program. Factors that led to exclusion included self-injurious behaviors and significant contractures in both upper extremities. Detailed demographic features of the included participants are discussed later. For this study, patients were excluded if they participated in group-based treatment, were absent 20% or more days of the program, or had incomplete data, such as missing pre- or post-COPM assessment. For all children in this clinical program, functional capacity was classified preintervention with the Manual Ability Classification System (MACS) and the Gross Motor Function Classification System (GMFCS). Although these scales are intended for use with children with cerebral palsy, they were deemed appropriate for this study to categorize functioning of all participants. Manual Ability Classification System. The MACS (Eliasson et al., 2006) is a 5-point classification system that describes how children with cerebral palsy use their hands to interact with objects in daily activities. In determining each child's MACS level, combined caregiver input and clinical observation of the child's typical performance are considered. The MACS level has been shown to have good validity and reliability (Eliasson et al., 2006), and there is evidence that it is stable over time (Öhrvall, Krumlinde-Sundholm, & Eliasson, 2013). Gross Motor Function Classification System. The GMFCS (Palisano et al., 1997) is a five-level system that describes the gross motor skills of children with cerebral palsy. Levels are determined by the child's functional ability, use of assistive devices or wheeled mobility, and quality of movement. Specific curves of gross motor development have been described for each of the five GMFCS levels (Rosenbaum et al., 2002). Canadian Occupational Performance Measure. The primary outcome measure analyzed in this study was the COPM (Law et al., 2005). This tool is a client-centered measure with the goal of identifying and quantifying a person's priorities in the domains of self-care, productivity, and leisure. The COPM is an individualized measure that is completed through a semistructured interview with either the patient or the caregiver. This measure is divided into three separate domains: self-care includes personal care, functional mobility, and community management; productivity includes paid or unpaid work, household management, school, and play; and leisure includes quiet recreation, active recreation, and socialization. During the interview, the patient or caregiver identifies an unlimited number of occupational performance problems and rates the importance of these problems on a scale of 1 to 10, with 10 indicating the most important. With the assistance of the assessor as needed, the caregiver then prioritizes the top five to six most important goals. Level of performance and satisfaction for each of these five to six goals are rated on a scale of 1 to 10. Average scores for performance and satisfaction before and after intervention are then calculated. The COPM has good construct, content, and criterion validity (Law et al., 2005) and adequate test–retest reproducibility (Aarts, Jongerius, Geerdink, van Limbeek, & Geurts, 2010; Verkerk, Wolf, Louwers, Meester-Delver, & Nollet, 2006). It has demonstrated responsiveness to change in pediatric clinical trials, with a 2-point change being considered clinically significant (Law et al., 2005). The COPM was completed for each child on the day of admission to the program during the standard parent interview as part of a battery of assessments. The top five to six parent-rated goals were recorded for this study. Each goal was coded according to the method described by Cieza et al. (2005) with the ICF-CY (World Health Organization, 2007). This coding strategy allowed for larger groupings of goals and consideration of overall themes. When coding, the theme of the goal was analyzed and compared with existing codes on the ICF-CY. For example, if a parent expressed that a program goal was “to get their right hand stronger,” it was coded as (b7300), power of isolated muscles or muscle groups (World Health Organization, 2007). If the parent reported that she wanted her child to “push her right arm through her sleeve with greater efficiency,” it was coded as (d5400), putting on clothes (World Health Organization, 2007). The use of these larger categories to describe parent statements allowed grouping of similar goals and reporting of trends in goal setting and goal selection by parents. The CIMT intervention in this outpatient clinical setting consisted of 16 days of unimanual practice and shaping of new skills with the affected upper extremity with a long arm cast worn 24 hours a day on the unaffected side. After the cast was removed, the patient participated in bimanual training for 5 additional days. Participants received 3 hours of 1:1 intervention daily, divided between occupational and physical therapy. Additional information about this program can be found in the report by Reidy et al. (2012). Statistical analysis was performed with the Statistical Package for the Social Sciences (SPSS), version 23.0, for Windows. Demographic and outcome data are summarized and descriptive statistics calculated depending on data distribution. Changes in group findings between baseline and follow-up assessment for continuous variables were evaluated with paired t tests. Mean change in total performance and satisfaction scores on the COPM was calculated for the whole sample, and data were analyzed by age groups, MACS level, GMFCS level, side of impairment, and gender. Analysis of ranked variables was performed with the Spearman rank correlation test. A significance level of .05 was used. A total of 81 cases were reviewed. Participants were excluded from this data set if they participated in group-based treatment (n = 29), were absent for 20% or more days of the program (n = 5), or had incomplete data, such as missing pre- or post-COPM scores (n = 6). The 41 remaining cases were analyzed for this study. Children with either congenital or acquired hemiplegia were grouped for analysis because no difference was found between groups in a previous analysis of the results of this clinical program (Reidy et al., 2012). Side of hemiplegia also was not found to be a significant factor in program outcome (Reidy et al., 2012) and therefore was not analyzed. A total of 41 children with hemiplegia participated in the study (25 boys, 16 girls; mean age, 3.7 years [SD = 1.8; range, 1.4–12.4 years]; GMFCS level I = 24, II = 17; MACS level I = 10, II = 22, III = 9). A description of the study participants is reported in Table 1. For the group of 41 participants, 219 goals were recorded. Most of the goals analyzed were in the ICF-CY domain of activities and participation (n = 194; 88.6%), and the remaining goals were in the domain of body functions (n = 25; 11.4%). The most frequently reported goal areas were in the domains of (d4), mobility (n = 99; 5.2%), and (d5), self-care (n = 79; 36.1%). Figure 1 shows the goals in greater detail. 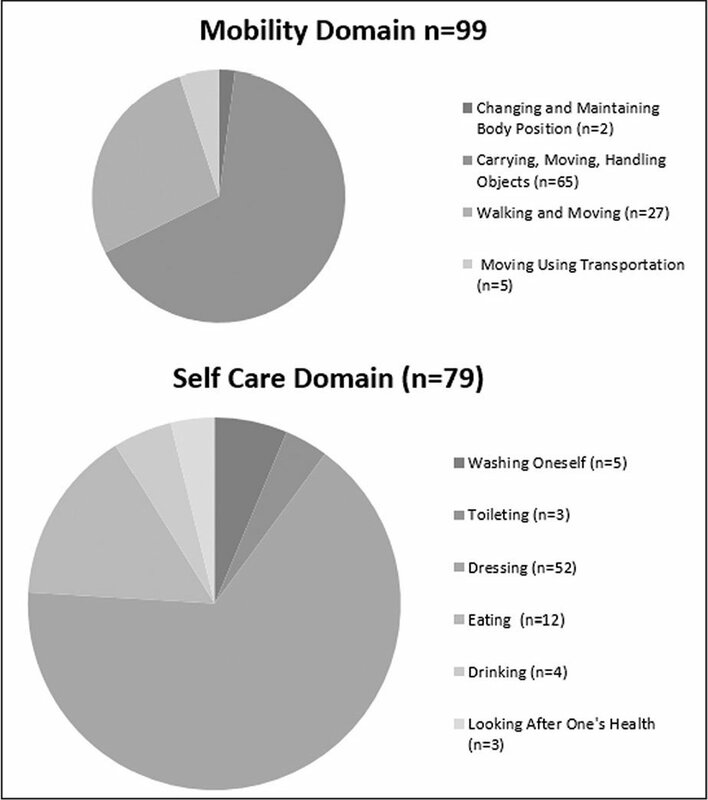 Breakdown of goals in the mobility and self-care domains. Of the 25 goals reported in the body functions category, 44% (11 goals) were related to muscle functions and 56% (14 goals) were related to movement functions. Among the whole cohort, the top two body function codes were (b755), involuntary movement reaction function (n = 11; 44%), and (b7300), power of isolated muscles or muscle groups (n = 11; 44%). Of the 194 activities and participation goals, the most frequent were (d5400), putting on clothes (n = 41; 24.1%), and (d4402), manipulating (n = 23; 11.9%). Figure 2 shows the subcategories of goals in the activities and participation category. Breakdown of activities and participation goals by category from 41 participants. The sample was further analyzed for frequency counts by age group. Age groups were determined developmentally as infants and toddlers (0–2 years 11 months), pre-school-aged (3 years–4 years 11 months) and school-aged (5 years and older). In the infant and toddler group, there were a total of 11 body function goals, with the most frequent (b755), involuntary movement reaction function (n = 6; 54.5%), which reflected protective response goals that parents often had. In this age group, activities and participation goals (n = 68) were primarily related to mobility domains and emerging hand skills, including (d4551), climbing (n = 9; 13.2%), and (d4402), manipulating (n = 9; 13.2%). In the preschool-aged group, parent priorities in the body functions (n = 13) realm focused on (b755), involuntary movement reaction function (n = 7; 53.8%), but parents noted (b7300), power of isolated muscles or muscle groups (n = 5; 38.5%), as the second most important body function priority. In activities and participation (n = 94), a shift toward more self-care and fine motor goals was seen, and (d5400), putting on clothes (n = 25; 26.6%), was the most frequently stated goal, followed by equal identification of (d4402), manipulating (n = 8; 8.5%), and (d4459), hand and arm use unspecified (n = 8; 8.5%). Finally, in the school-aged group, less emphasis was placed on body function goals because only one goal (b7300), power of isolated muscles or muscle groups (n = 1), was identified in this subgroup. Significant emphasis was placed on activities and participation goals (n = 32), with (d5400), putting on clothes (n = 7; 21.9%), noted as the primary goal and (d4402), manipulating (n = 6; 18.8%), as the secondary goal. Review of trends in goal selection showed that parents selected goals that were developmentally appropriate for the age of their child. A paired samples t test was used to compare COPM performance and satisfaction scores post-CIMT intervention. The total sample (n = 41) showed a significant difference in COPM performance scores pre-CIMT (M = 3.18; SD = 1.0) and post-CIMT intervention (M = 5.50; SD = 1.76; t = 9.349; p < .001, two-tailed). Similarly, significant gains were seen in COPM satisfaction scores pre-CIMT (M = 3.23; SD = 1.48) and post-CIMT intervention (M = 6.30; SD = 1.93; t = 9.897; p < .001, two-tailed). 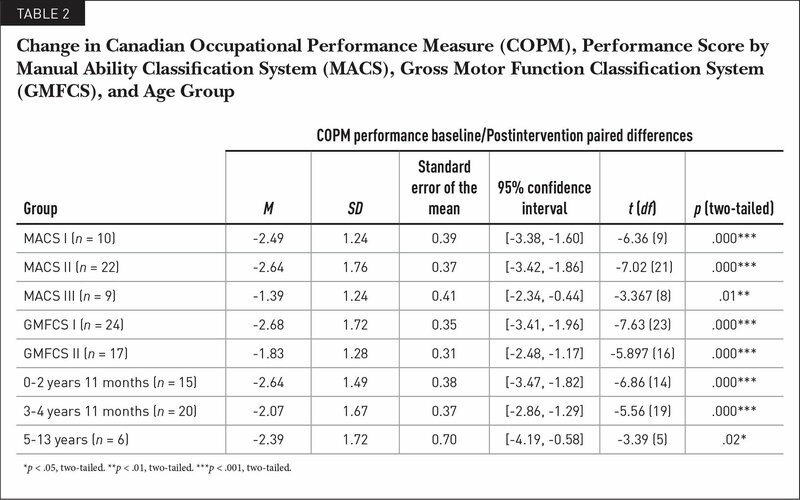 Table 2 summarizes COPM performance scores preand post-CIMT intervention by age group and MACS level. Parents of children in the youngest age group (0–3 years) reported the most significant positive change in both COPM performance and satisfaction. In addition, COPM performance scores postintervention were significantly associated with satisfaction (rs = .844; p < .001). In general, COPM performance scores postintervention were negatively correlated with MACS (rs = −.343; p = .03) scores. Children with better manual ability—those with MACS levels I and II—showed the greatest change in mean performance. Consistent with previously published research (Miller et al., 2014), children who had better manual ability achieved higher COPM performance scores postintervention. No association was found between COPM performance and satisfaction scores and GMFCS level. Most parent-reported goals were in the ICF-CY domain of activities and participation. Other studies have reported that many standardized structured and observational assessments do not capture the unique goals and needs of families (Wiart, Ray, Darrah, & Magill-Evans, 2010). Research on the effect of age on the outcome of CIMT treatment was listed as a priority recommendation by a recent consensus report on CIMT for children with unilateral cerebral palsy (Eliasson et al., 2014). Our study used distinct age group comparisons with the same model of CIMT. Although children in all age groups showed a clinically significant change (≥2 points) in performance and satisfaction, younger children made greater progress than older participants, according to COPM mean change scores. Parents of children in the youngest age group (0–3 years) reported the most significant positive change in both COPM performance and satisfaction. Performance ratings postintervention were significantly associated with reported satisfaction. One working hypothesis that explains this larger gain is that CIMT is working to reverse the child's disregard of the affected hand early and therefore reducing secondary effects. With early, intense intervention, there is early parent education on appropriate cues and expectations for use of the affected arm and hand as an assisting or helping hand in functional tasks. Learning to use the hand early to achieve independence with functional goals prioritized by families helps the children to build bimanual use into daily routines at an earlier age. This is in contrast to learning new motor patterns and methods at a later age, after compensatory or adaptive strategies have been learned, practiced, and repeated. DeLuca, Ramey, Trucks, and Wallace (2015) reported that in a study of children receiving multiple episodes of CIMT, the treatments that were provided first, when the child was youngest, produced the largest positive change in functional skills. The possibility of a greater CIMT training effect in younger age groups is further supported by theories of enhanced neuroplasticity of the young brain (Martin, 2012) and evidence of higher rates of development of the affected hand in bimanual activities in children younger than 3 years old (Holmefur, Krumlinde-Sundholm, Bergström, & Eliasson, 2010). Another study showed that children who had baby CIMT in the first year of life had significantly better bimanual hand use (Assisting Hand Assessment scores) at 2 years old compared with children who did not receive baby CIMT (Nordstrand, Holmefur, Kits, & Eliasson, 2015). The youngest child in our study was 1.4 years old. Additional research on the advantages of early CIMT initiation with children younger than 3 years old is warranted. Knox (2008) also examined the role of age and type of cerebral palsy on parents' goals for physical therapy. Although that study included children not only with hemiplegia but also with diplegia, athetosis, and spastic quadriplegia, similar themes emerged in parent-identified goals. Knox (2008) reported “[t]welve specific categories of concerns . . . activities of daily living, hand function, eating/drinking, floor mobility, sitting, stand/walk, transfers, stiffness, communication, therapy, visual perception and behavior” (p. 56). Those findings also concluded that age, severity of disability (using the GMFCS), and type of cerebral palsy had an effect on parent goals. Parents of children with hemiplegia put a greater priority on hand skills. In that study, younger participants' parents, those with children up to 4 years old, also reported greater importance of floor mobility, with a change to communication as the prioritized goal as children approached school age (4 to <6 years old) (Knox, 2008). This trend of goal shifting with age and developmental changes was also apparent in our data set. A common difficulty that clinicians report is that standardized outcomes are not necessarily sensitive to small or specific changes in each patient's function. Standardized, observation-based outcomes that assess impairment or activity domains are not necessarily sensitive to changes in activities of daily living (Steenbeek, Gorter, Ketelaar, Galama, & Lindeman, 2011). Further, these outcomes are most often specific to certain motor or component skills rather than participation. The COPM allowed for communication between the family and therapists and created a partnership in the goal selection process. The authors recognize and support the philosophy that, when possible, it is important to involve the child in goal selection. In addition, many assessment tools are not sensitive enough to measure progress in children who have cerebral palsy and developmental disorders. Assessments that are sensitive enough to detect changes tend to detect changes in the domains of impairment (i.e., strength, range of motion) or activity (i.e., the Quality of Upper Extremity Skills Test [DeMatteo, Law, & Russell, 1993] or the Assisting Hand Assessment [Krumlinde-Sundholm, Holmefur, & Eliasson, 2014]). Change in children with cerebral palsy can be very slow and can become slower as children age (Rosenbaum et al., 2002). In addition, change can be dependent on uncontrollable factors, such as tone, growth spurts, medical procedures, and surgeries. This review of clinical data was an informative first step in better understanding the goals and concerns of parents and participants in CIMT programs. Future studies would benefit from more detailed descriptions of participants, including parent educational levels, the effect of comorbidities and cognitive levels, socioeconomic status, time from injury for participants with acquired hemiplegia, birth order, presence of siblings, and prematurity. Children older than 13 years were excluded from the study because they often self-reported goals as opposed to parent reporting of goals when the children were admitted to the program. To keep the study sample comparable, they were excluded from this analysis and review. Therefore, our results cannot be generalized to older children (>13 years). Older children may have different goals than their parents and may be less motivated by goals set by their parents. Setting client-centered goals for youth who are still minors in their parents' households may be a challenging and complicated process that requires negotiation among the family, the youth, and the therapist. Further examination of self-reported goals by children and comparison with parent-selected goals would also be an interesting future area of study. A future investigation of the role of motivation and its effect on the rate of achievement of goals also would be of interest. Krumlinde-Sundholm, L., Holmefur, M. & Eliasson, A. C. (2014). Assisting hand assessment manual, research version 5.0. Stockholm, Sweden: Karolinska Institute, Neuropediatric Research Unit, Astrid Lindgren Children's Hospital. Law, M., Baptiste, S., Carswell, A., McColl, M. A., Polatajko, H. & Pollock, N. (2005). Canadian occupational performance measure (4th ed.). Ottawa, Canada: Canadian Association of Occupational Therapists Publications ACE. World Health Organization. (2007). International classification of functioning, disability, and health: Children and youth version: ICF-CY. Geneva, Switzerland: Author. Ms. Reidy is Senior Occupational Therapist, Ms. Naber is Senior Physical Therapist, Fairmount Rehabilitation Programs, and Dr. Stashinko is Director of Clinical Research, Neurodevelopmental Medicine, Kennedy Krieger Institute, Baltimore, Maryland. Dr. Stashinko is also Adjunct Faculty, Johns Hopkins University School of Nursing, Baltimore, Maryland. The authors thank Jaclyn Stephens, PhD, OTR/L, for her assistance in editing the manuscript. Address correspondence to Teressa Garcia Reidy, MS, OTR/L, Senior Occupational Therapist, Fairmount Rehabilitation Programs, Kennedy Krieger Institute, 1750 East Fairmount Avenue, Baltimore, MD 21231; e-mail: reidy@kennedykrieger.org.